NANORESTART – a multinational research initiative to introduce nanotechnology solutions to the conservation and preservation challenges of modern and contemporary art – is now in full swing here at Tate. As we described in our previous update, we have narrowed down our case study list to three artworks from the collection, each of which will be investigated in great detail, replicated in a series of mock-ups used for testing cleaning options, and eventually considered for surface cleaning by one of Tate’s expert conservators. The first case study will focus on two sculptures created in 1967 by Michael Dillon – both titled Op Structure. The plastic pieces consist of opaque, white boxes which enclose a variety of brightly coloured and textured plastic sheets; the scalloped, transparent fronts of each box create an optical illusion of colourful movement as light is transmitted and reflected from the pigmented backing sheets and refracted through the curved texture of the transparent plastic front sheet. Even the smallest movement by the viewer changes in broad sweeps the transmitted colours, resulting in an incredibly dynamic visual experience. Whilst Dr Lora Angelova, one of Tate’s NANORESTART researchers, began the technical examination and scientific analysis of the composition of the two pieces, sculpture conservator Gates Sofer assessed their conservation needs and began searching for the artist. Facts known about the artist include his year of birth (1941), and that he attended the Royal College of Art, where he created the two Op Structure sculptures. These two works were then purchased by the V&A in 1967; after that, Michael Dillon’s contact details were lost. The ensuing (and ongoing) detective work about the artist carried out by Gates has turned up little further information. The two works were transferred to Tate in 1983 as part of the newly established National Heritage Act. At that time, it was decided that Tate should hold the national collection of sculptures made after 1900 and the V&A will hold works that pre-date 1900. Tate curators have tried to find Michael Dillon in the past to inform him of the transfer of his works, but to no avail. Conservation is now trying to find him in order to fully understand the display methods for the sculptures. From researching Dillon’s other work, it is assumed that they should be displayed with a light source behind them. It would be great if we could interview the artist to set the record straight. In the meantime, our scientific analysis of the composition of one of the two sculptures revealed that it was entirely composed of poly(methyl methacrylate) – aka PMMA, acrylic, Perspex®, or Pelxiglas®. The pieces seem to be joined with ‘PMMA cement’, a glue for acrylic materials which, when dry, has the exact same composition as the acrylic sheets themselves. There is a light cover of dust on the transparent, scalloped fronts whilst the white sides of the boxes have an overall dull, slightly grubby look – primarily a result of fingerprints and handling. Because the two objects have remained in a museum environment over the past 50 years, the plastic is in very good condition with little evidence of degradation. The rectangular Op Structure has two adhesive-labels on the sides, which were evaluated and deemed unnecessary; their removal would be a part of the treatment challenge. Contemporary museum practice dictates that labels should not be adhered to plastic objects as they are considerably difficult to remove without damaging the surface of the artwork. However, in the past, when plastics were relatively novel and not well-understood, such practices were common, as can be seen with this sculpture in Tate’s collection. Two adhesive-labels on the rectangular Op Structure which are to be removed during the treatment of the sculpture. Here, a sticker placed by Tate, likely on arrival of the sculpture in the early 1980s. Samples were taken from both labels and the adhesive composition was analysed in the Conservation Science laboratory at Tate. Both labels’ glues fall under the broad category of ‘PSA’s – pressure sensitive adhesives – materials which stick onto a surface just by application of pressure. Invented in the late 19th century, these adhesives make-up the majority of ‘sticky’ things we are familiar with in contemporary times. The two labels on Dillon’s Op Structure have different types of PSAs, characteristic of the general time of their application. The blank, more yellowed, and likely older label is adhered with a synthetic styrenated rubber adhesive, whilst the Tate Gallery label is adhered with an acrylate-based adhesive (2-ethylhexyl acrylate). After analysing the chemical composition of the glues on a range of blank labels collected from stationary cabinets throughout the museum offices, we found a match for both labels on the sculpture. Interestingly, the current ‘Tate Gallery’ labels use a different adhesive backing than the one found on the sculpture – probably due to a change in supplier or adhesive formation. The glues on a series of labels were tested until we found a set which matched that on the Dillon sculpture. These two labels were stuck onto semi-opaque, white acrylic sheets which correspond to the composition of the Op Structure outer box. We also ordered a series of 3 mm thick ‘opal’ Perspex® sheets with different opacities in order to find one that matched the walls of the sculptures. It is this portion of the artworks which will be the primary focus of the cleaning treatment – the coloured sheets and the transparent fronts are in good condition. Once we had gathered all of the materials for our mock-ups – opaque acrylic sheets, adhesive-labels, PMMA cement, and artificial soil – we began the assembly. 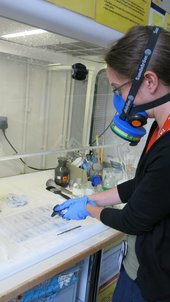 Since we would like to carry out many cleaning tests using our novel NANORESTART gels and solutions, as well as a range of other cleaning materials currently in use by conservators, we subdivided each sheet into 36 test sites – two sites on each sheet will be reserved as controls, so in total we can test up to 34 cleaning systems. We covered the test sites with sticky labels (of each type), two types of artificial soil (one akin to finger grease, and one more comparable to dirt), a mixture of PMMA cement and carbon black powder, and left some blank to serve as controls. So that we can test the reproducibility of cleaning methods, we prepared three of each type of mock-up sheet – in total, that equates to 612 test sites! Artificial sebum soil (i.e. finger grease) was distributed onto the plastic sheets with a spray gun. Carbon black powder was sifted onto the greasy plastic using a fine sieve. Sculpture and Installation conservator Gates Sofer dusting carbon black powder onto plastic sheets covered with PMMA cement in the laboratory fume cupboard. All of the test sites were imaged using a Hirox digital microscope, purchased for NANORESTART, so that we could gain an understanding of the structure and topography of the surfaces. The glossiness and colour of each test site was also measured. The gloss of acrylic plastic is one of its most prized and problematic characteristics – the very act of wiping the surface can introduce fine scratches which over time can make the surface appear dull. A cleaning treatment that changes the gloss level of the mock-ups will be avoided during the final treatment of the artwork. Colour change will be useful in evaluating the reduction of the grey, grimy, artificial soil and the return of the surface to the white, pristine colour. Besides these scientific measurements of the mock-ups, Gates made a list of conservator assessments for the evaluation of our various cleaning tests including ‘ease of use’, ‘health & safety’, ‘cleaning speed’, and ‘visible residues’ which will also form part of the assessment process. A 100-times magnification image of the surface of a pristine plastic mock-up sheet. A mock-up covered with artificial sebum soil and carbon black particles. The gloss and colour meters (figs.12 and 13, respectively) are used to measure these two characteristics of the surface before and after the cleaning trials. A transparency sheet is used to protect the surface of the mock-ups from the instruments, and to guide their placement onto each test-site.